We would like to thank Gordon Neighbourhood House, Andrew Christie, their management team, Lucy Rodina, Eduardo Jovel, Will Valley, and groups 14, 16, and 17 in our tutorial for all the support that has been provided to us throughout the semester; it was a pleasure working with everyone! As students in the Faculty of Land and Food Systems in the third course of the Land, Food, and Community Series, LFS 350, we were provided with the opportunity to transform our classroom knowledge into practical, hands-on skills by connecting with a community partner already conducting work within the local food system. Our group was partnered with the Gordon Neighbourhood House located in the West End community of Vancouver in which we collaboratively organized an information and food skills-sharing event called "Urban inFARMation". We were interested in exploring how community members self-identified their individual status on food security and what aspects of food influence them to prepare meals at home. As result, our research question was: What are the main aspects of food that influence participants’ choices on food preparation at home? Personal conversations with community events during the event and an online survey through SurveyMonkey with additional questions were developed in collaboration with group 14 of our tutorial in order to attain our data. We found that event participants identified "health concerns" as one of the most important aspects that they consider when making their food decisions. They also found the event to be helpful and resourceful in terms of providing information on how to prepare simple and healthy meals and how to start their own herb garden at home. It is important to acknowledge that the low number of respondents to both our event and survey does not allow us to make any significant conclusions about the status of food security among community members around the Gordon Neighbourhood House. However, it does inform us about the value of offering free and accessible food information-sharing events to community members of the West End neighbourhood and for Gordon Neighbourhood House to consider further developing programs focused on diverse perspectives of healthy eating. As UBC students from the Faculty of Land and Food Systems we are currently enrolled in LFS 350. The Community-Based Experiential Learning (CBEL) project was to plan a Collective Kitchen workshop for community members. We worked with Andrew Christie, a Community Food Advocate and indirectly with Susanna, the Lead Farmer and their management team at the Gordon Neighbourhood House (GNH). GNH is located in downtown Vancouver, which encompasses the West End, Yaletown and Coal Harbour neighbourhoods. The aim of the event, called the “Urban inFARMation Fair”, was to offer information and learning opportunities to community members by providing a platform for other groups to promote the urban farm and herb garden toolkits. The community immediately surrounding GNH has several food services, but it is important to acknowledge that there are many unidentified community members who are experiencing food insecurity. From 2009 to 2010, the rate of food insecurity in British Columbia was at 8.4% (Health Canada, 2012). Contributors to food insecurity include financial challenges and/or the lack of accessibility to nutrition-based education, leading to the increase of food bank use of more than 20% since 2008 (Rideout & Kosatsky, 2014). Due to these barriers, the presence of high-end supermarkets that provide expensive food items does not foster food security. As a result, GNH aims to improve the quality of life of community members through food. Two of the proposed food principles focus on increasing access to food for those who are nutritionally vulnerable and sharing food that is nutrient-dense, low in refined sugar and sodium, and not overly-processed (GNH, 2014). Furthermore, GNH supports the development of urban farms by building and maintaining a community garden and promotes healthy food cooperatives. This provides a healthy, sustainable, and accessible option for community members to learn independent skills and connect with one another. The objective of our food systems model of GNH is to exemplify the multi-faceted nature of the community and the complex interactions that are consistently occurring, in order for the local food system to function effectively. It is worthy to note that neighbourhood houses are inherently diverse in terms of their inputs and outputs as they connect with a variety of individuals, groups, and organizations in different sectors of society. The model also highlights the boundaries and levels of parties that are involved. INPUTS: Programs and Services in the neighbourhood house are receiving a significant number of inputs as they require financial funding, volunteers, local donations, and GNH’s guiding principles for them to be organized and run sustainably. OUTPUTS: GNH’s facilities are an output to the media and partner organizations, as their spaces are made available for rent for programs, workshops, and/or events. INPUT & OUTPUT: The interaction between GNH and the external media beyond the West End Neighbourhood are an output and input to each other as media promotion brings awareness to the public about the neighbourhood house’s work, which in turn is broadcasted back out to the community. After developing a better understanding of GNH’s food system concerns, we were interested in understanding the lived experiences of community members in regard to how they identified their individual status of food security. Therefore, our research question is: What are the main aspects of food that influence participants’ choices on food preparation at home? We focused on identifying what factors influence community members to make their decisions when preparing food at home, and if these influences indicate a trend that reflects local food discourse. In turn, this information could provide GNH with additional knowledge on how to further develop food programs and services with more specific objectives to achieve or enhance food security. The project event took place on November 18th from 7pm - 8pm at Gordon Neighbourhood House. The event consisted of a food demonstration and promotional information, as well as a component of group research, called the “Urban inFARMation event”. Primary design of the event was to promote both the herb garden and urban farming toolkits constructed by other tutorial groups in LFS 350. At this time our group collected data to use for a mixed-methods approach analysis, in which methods of collection included both quantitative and qualitative evaluations of participants. Our qualitative research was done at the event through observations of participants, encouraging and engaging in conversation, and recording researcher analyses based on individual perspectives (Creswell, 2003). Quantitative research included data collection analysis through the voluntary post-event online survey, as well as participant count. A location for the collection of email addresses was set-up at the information table, and a monetary incentive of $40 to the Vancouver Farmer’s Market was given to participants for providing their email address (we ensured them it was for the sole purpose of sending out a follow-up email survey). At all times our research group maintained confidentiality of personal information collected at the event and through the email surveys given out. 1. How many times/week do you prepare a meal at home? This question helped us analyze how significant their considerations for food are: if people eat out a lot, then their considerations for eating at home will not be as significant to their overall food choices. 2. Rank, in order, your top three considerations for your choice of ingredients when preparing a meal at home? 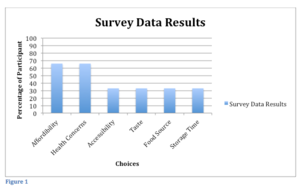 If the considerations are similar across many survey answers, this may indicate a trend regarding food considerations within the community surrounding GNH, and if they are cause for concern. If participants compile their own answers (as opposed to choosing from a pre-written list) this will reduce the risk of exposing any sensitive circumstances that participants may have for meal preparation. 3. Were there any aspects of the GNH urban inFARMation event that provided you with new information? This question allowed us to determine which areas of the event were most successful, informative, and beneficial to the participants who attended, in order for GNH to create more successful events in the future. The data from SurveyMonkey was compiled, and as a group we sorted through the individual answers in order to formulate any indication of a pattern in participant answers. Resources for event planning and organization included Andrew Christie as the sole community partner liaison and our TA, Lucy Rodina, for important charter and project advice and information. Notes and readings from both the internet and our LFS class as well as the TCPS2 ethics tutorial regarding ethical research allowed us to collaborate knowledge with our partner group to host an appropriate event. Individual personal experience of past projects also helped us plan the event. Email correspondence with Andrew was done through a single group member in order to ensure organized communication, although face-to-face communication was more effective in establishing concrete event plans. Initially, the event was a potluck. As the focus of our event changed into a promotional platform, methods of data collection needed to correspond accordingly. Rather than handing out surveys for participants like we initially planned, post-event email surveys were now more appropriate. This evolution required the re-creation of group ideas, as well as promotional material redesign and reconstruction. Q1: How often do you prepare a meal at home? These answers indicate that the respondents prepared meals almost or at least once a day, and therefore incorporated considerations into their food preparation quite often, indicating our second survey question is relevant. Figure 1: These answers indicate that the two most popular considerations were (1- most important) Health concerns, and (2- second most important) Food Affordability. Respondents also considered accessibility, freshness, shelf life, and taste to be among the most important considerations. Q3: Were there any aspects of the GNH Urban InFARMation event that provided you with new information? Participant 1: One of the programs provided some insights into a building a community farm. Local grown foods. Participant 2: garden kits, recipes, an amazing course offering at UBC! Participant 3: Yes. I found out a lot of information about the local urban farms and also a great recipe for soup and salad dressing. These answers indicate that people were aware of the promotions for the toolkits during the event, that they learned something about urban gardens through promotion of the toolkits, and enjoyed the food provided for them. Conducting informal conversation with participants during the event is a form of qualitative data collection. Participants found that the event was helpful and resourceful in terms of providing information on how to prepare simple, healthy meals and how they can start their own herb garden at home with the toolkits that were being promoted. Throughout the evening we learned many things, such as the value of free social events in the community, fostering safe and healthy relationships, reaffirming the power of food and also learning new dishes and ideas by exchanging food recipes and interacting with others. We met participants that had never attended an event at GNH, yet came inside through our promotional “Free Food” sign posted outside. She was impressed with the soup and salad dressing we provided, and was excited to try making the recipes at home. Observational data showed that people appeared to be enjoying themselves, and Andrew was impressed with the overall “chatter” among people in the room, and everyone was smiling and talkative with others. The survey data collected (regarding food preparation) is only significant if each participant prepares food at home on a regular basis. Since all three respondents prepare a meal at home about (or at least) once a day, we can consider their preparation considerations as significant contributions towards answering our research question: What are the main aspects of food that influence participants’ choices on food preparation at home? Our results show a consideration of health concerns and affordability to be the most important aspect of food preparation. People who eat at home more often care more about affordability, while others who do not cook at home as often focus more on health concerns and freshness of food products. These findings suggest that there are still food security issues in the community since food affordability is a major concern for people living in the West End. Ostry (2010) mentioned in his article that price is, indeed, one of the determining factors in causing food insecurity in British Columbia (p.7). Due to lower-incomes, some people are forced to reduce their intake of fruits, vegetables, and milk products, causing them to be food insecure (Ostry, 2010). Results also suggest that participants are likely to utilize the healthy recipes we gave out at the event. This assumption is based on both qualitative and quantitative answers we received. Among the conversations, we found out that people care about healthy eating through their enthusiastic appreciation of the healthy meals and recipes we provided. They expressed appreciation of the delicious soup and interest for making it themselves at home. This reflects the answers to the survey questions. Two participants listed health concerns as a major aspect of food preparation, and one respondent listed the recipes as an aspect of the GNH event they found helpful. Since the survey also revealed all participants prepare a meal approximately once a day, they are therefore likely to utilize the recipes in food preparation at home. Both qualitative and quantitative data analysis determined the Urban inFARMation event as successful in many ways. Survey participant 1 thought the event provided “insights into a building a community farm” as well as local grown foods. Participant 2 acknowledged learning more about garden kits, and participant 3 learned new information about local urban farms. These answers demonstrate that our goal as a promotional platform for the toolkits was successful, as every participant who took the survey acknowledges learning a new aspect about urban gardens. Qualitative data from event conversations and observations also perpetuated this opinion, as many people at the event were seen engaging in conversation with the toolkit tables. After the event, Andrew expressed approval of its success, despite the short promotional time we had to plan it and the minimal number of people who actually attended. In contrast to the success of the event, the evening also contained aspects of failure, discussed within the framework of limitations. In contrast to the successes, there were limitations which led to the failures of the event. Miscommunication posed some barriers and challenges. At times, it was very difficult to get a hold of our community partner and changing plans so close to the event date limited our ability to promote the event to other organizations. As a result, many people who had intentions to attend the event were not able to come due to short notice. The idea of an online survey requires computers and the Internet in order to complete, and some may not have access to these resources. Quantitative data collection was challenging because the number of participants was limited, and not all of them took part in our survey. Due to the limited amount of survey data, analysis may not properly reflect main discourses within the surrounding community. Time restrictions in taking the survey (we needed the results by the following week) may have been a deterrent for people who signed up to receive the email for the survey. Success of future events like this one depends on many factors. Hosting it on a weekend may be more beneficial than a weekday, when people are not busy at work. Furthermore, promotion of urban farming and garden toolkits would be more attractive in the early spring, before planting season. Finally, communication should be more concretely established between planning committee members in order for promotions to be effective and timely (Mills, 2012). The aim of the Urban inFARMation event was to promote local food production and encourage the utilization of community gardens through the developed toolkits. As health concerns, economic affordability and natural foods were the top three considerations affecting people’s food choices, we believe that healthy and affordable foods can be used to encourage people’s participation in kitchen events in the future. The long-term goal to enhance food security of the community by providing local, fresh and readily available food is done through the provision of information sharing. We hope more community-based learning opportunities can be offered by encouraging more cooperation between academics and communities. As students, we were able to gain practical experience in project planning and large-group work while community partners hopefully benefited from the events and research results at the same time. GNH, Gordon Neighbourhood House. (2014). Food Philosophy. Retrieved fromhttp://gordonhouse.org/about/right-to-food/. Medical Journal, 56(1), 29 - 46. This page was last edited on 30 November 2015, at 19:59.